Each frame is 0.1 seconds apart. Kirsty Coventry's time for this event was 2:04.81. The notable features of this swimmer's technique viewed from the right side are similar to those in the left-side analysis. Consequently, they are noted below in abbreviated form. Frame #1: The right arm enters with the hand tending to be behind the head and possibly with a hyperextended elbow that gives the arm an overly "arced" appearance. The left hand finishes deep and has counterbalanced a considerable amount of the vertical force component created by the latter stage of the right arm's recovery. The swimmer is streamlined well. Frames #2 and #3: The swimmer rolls to the right and straightens the right arm with the hand being repositioned to create a force backward. The recovering left arm promotes the roll. Propulsion from the right arm is developed by slight wrist flexion, elbow flexion, and abduction of the upper arm. The right leg kicks to counterbalance the recovering left arm. Frames #4 through #7: The right arm is positioned so that the whole arm forms the propulsive surface. Propulsive forces are directly backward, as can be seen by the pocket of drag-force turbulence following the arm in Frame #7. Frame #8: Right arm propulsion is sustained until the arm is virtually extended with the hand hyperextended so that water can be pushed backward when the arm is no longer part of the propelling surface. The left hand has entered. Frame #9: The left arm is immediately repositioned to develop horizontal backward force. The right hand is pushed down, which assists the shoulders and hips to roll to the left to better position the left arm. This is another splendid illustration of developing continuity in force application as one arm takes over from the other. Frame #10: The left leg kicks. The right arm exits. The shoulders and hips roll to the right. Frames #11 through #15: The left arm produces a large propelling surface that creates forces directly backward. Frame #16: The stroke cycle starts again. 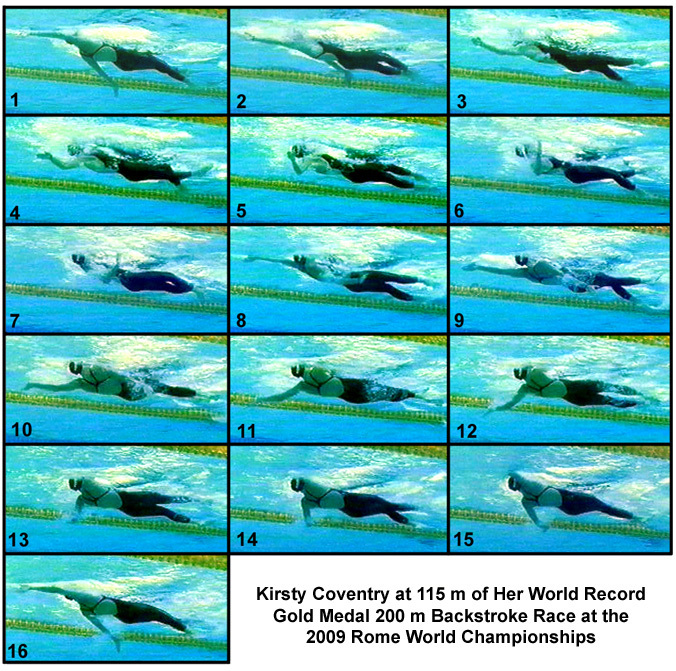 Kirsty Coventry's backstroke has many admirable features; continuous and direct force application, superb streamlining, body-hip roll that allows both the internal and external shoulder rotator muscles to abduct and adduct the upper arms, and relatively small kicks that mainly function to counterbalance the exiting/recovering arms. This is a model that could serve as an example of how to perform this competitive swimming stroke.